If you look up reviews for VO5's famous hot oil treatments you will get a 50/50 tie on if this stuff is a miracle product or if its terrible. I read a few pages of reviews and it defiantly left me curious. I wondered if this could be a miracle product for my damaged, untameable curly and frizzy hair. 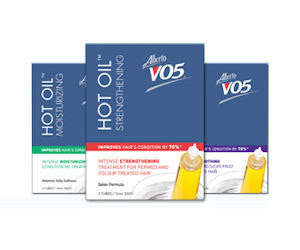 Another thing to consider with the reviews is their are so many different hot oil treatments by VO5 that end up just getting classified as the same product. They may be different. I choose the strengthing from the selection of the photos below. The package contains 3 hot oil treatments and I got them on sale for about $3.00 CDN. Even if it turned out to be crap I didn't feel like I was wasting my money. I should point out that they offer a single hot oil treatment for around $7.00. The packages however don't really provide that much information on the differences. I followed the directions keeping the hot oil on for 2 minuets (even though it says only up to one) and shampooed. At this point I wasn't thrilled. My hair felt brittle and dry so I loaded on some deep conditioner. When I blow dried it I still noticed it still felt a little odd and brittle. I was almost convinced it was a crap product until my mom started telling me my hair really did look alot healthier. In a sense I think this works a bit like a hair constructor that "glues" your hair back together when its really damaged. I'm quite pleased! I used it again last night and although I haven't taken it out of the crazy looking bun on the top of my head I think it helped. After I shampooed this time my hair was left silky and soft which was a surprise I don't usually experience after shampooing! I wouldn't recommend this for thin hair because it would probably be to heavy. For devil manes like myself though I think this is an amazing product with trying with an open mind. If you hair is really damaged its deffintly a better price tag then buying the Nexxus Emergencee Constructor for $50.00. Although if your hair is REALLY bad I would buy the Nexxus stuff fast! P.S. I would use conditioner with hot oils to try and restore some moisture and get rid of the brittle feeling! Hi there to all, it's truly a pleasant for me to pay a quick visit this web page, it consists of precious Information. get that kind of info in such a perfect way of writing? I've a presentation next week, and I'm on the look for such information. I don't want to tell you how to run your website, but what if you added something that grabbed folk's attention? I mean "VO5 Hot Oil Treatment Review" is a little boring. You could glance at Yahoo's home page and watch how they write article headlines to grab people to open the links. You might try adding a video or a picture or two to get readers interested about what you've got to say. It's an remarkable article in favor of all the online users; they will obtain benefit from it I am sure. Thanks for sharing your thoughts about online jobs from home. mention that I have truly loved browsing your blog posts. After all I'll be subscribing on your feed and I hope you write once more soon! After going over a number of the articles on your website, I truly like your technique of writing a blog. issues, The web site style is ideal, the articles is really great : D.
Hi there to every body, it's my first pay a quick visit of this website; this blog carries amazing and genuinely fine information for readers. I don't leave a response, however I looked at some of the remarks on "VO5 Hot Oil Treatment Review". I actually do have 2 questions for you if it's okay. Is it only me or do some of these remarks look as if they are left by brain dead folks? :-P And, if you are posting at additional sites, I'd like to follow you. Could you make a list of every one of all your social community pages like your Facebook page, twitter feed, or linkedin profile? I looked at. And after this article "VO5 Hot Oil Treatment Review". Excellent web site you have here.. It's hard to find excellent writing like yours nowadays. I seriously appreciate people like you! Take care!! In fact no matter if someone doesn't understand after that its up to other users that they will help, so here it occurs. got here to go back the choose?.I am trying to to find issues to enhance my web site! It's remarkable to visit this web page and reading the views of all colleagues on the topic of this post, while I am also eager of getting experience. It's going to be ending of mine day, however before ending I am reading this wonderful paragraph to increase my experience. Excellent site. Plenty of helpful info here. I am sending it to some buddies ans also sharing in delicious. am impressed! Very helpful info specifically the closing section :) I care for such info much. It's in reality a nice and helpful piece of information. I am happy that you simply shared this useful information with us. Please stay us up to date like this. Thank you for sharing. I'm gone to inform my little brother, that he should also pay a quick visit this blog on regular basis to take updated from most up-to-date news. Thanks for finally writing about > "VO5 Hot Oil Treatment Review" < Liked it! in the future. I want to encourage you continue your great writing, have a nice evening! and understand this side of your story. It's surprising you aren't more popular given that you definitely possess the gift. It's great that you are getting thoughts from this piece of writing as well as from our dialogue made here. I've learn some just right stuff here. Certainly worth bookmarking for revisiting. I wonder how a lot attempt you put to make one of these excellent informative site. Thanks for sharing your thoughts about online marketing. You're making it enjoyable and you continue to take care of to stay it smart. I can't wait to read much more from you. Did you develop this website yourself? Please reply back as I'm hoping to create my very own website and want to find out where you got this from or what the theme is named. Kudos! It's actually a cool and helpful piece of information. I am glad that you simply shared this helpful info with us. Please stay us up to date like this. Thank you for sharing. I'm gone to inform my little brother, that he should also go to see this weblog on regular basis to get updated from hottest reports. Hi there to every body, it's my first go to see of this webpage; this blog includes awesome and truly fine stuff in support of visitors. It's an amazing post in support of all the internet users; they will get benefit from it I am sure. Heya i'm for the first time here. I found this board and I find It truly helpful & it helped me out much. I'm hoping to present something again and aid others like you helped me. other person's blog link on your page at suitable place and other person will also do similar for you. exchanging links or maybe guest writing a blog post or vice-versa? but this weblog offers feature based articles. I'd state. That is the first time I frequented your web page and thus far? I amazed with the analysis you made to make this particular put up amazing. Fantastic task! I am really impressed along with your writing talents and also with the format on your weblog. best sites on the internet. I most certainly will recommend this site! I wonder how a lot attempt you place to create this sort of excellent informative web site. I'd really like to be a part of community where I can get advice from other knowledgeable individuals that share the same interest. If you have any suggestions, please let me know. Thank you! Do you've any? Please let me understand in order that I may subscribe. Thanks. Hi, I do believe this is an excellent web site. I stumbledupon it ;) I will come back once again since i have saved as a favorite it.